Students will be able to identify a given shape by its defining attributes. Gather the class together and show them a triangle drawn on a large piece of paper or displayed on the whiteboard. Ask, “What makes a triangle special?” Student answers might include: Three sides, three corners, or three vertices. Review the meaning of an attribute as it relates to shapes. An AttributeIs something that describes a shape, such as the colour, size, shape, or number of sides/corners/vertices. Review the definition of defining and non-defining attributes. A defining attribute is something a shape always has that makes it unique. For example, a triangle always has three sides. 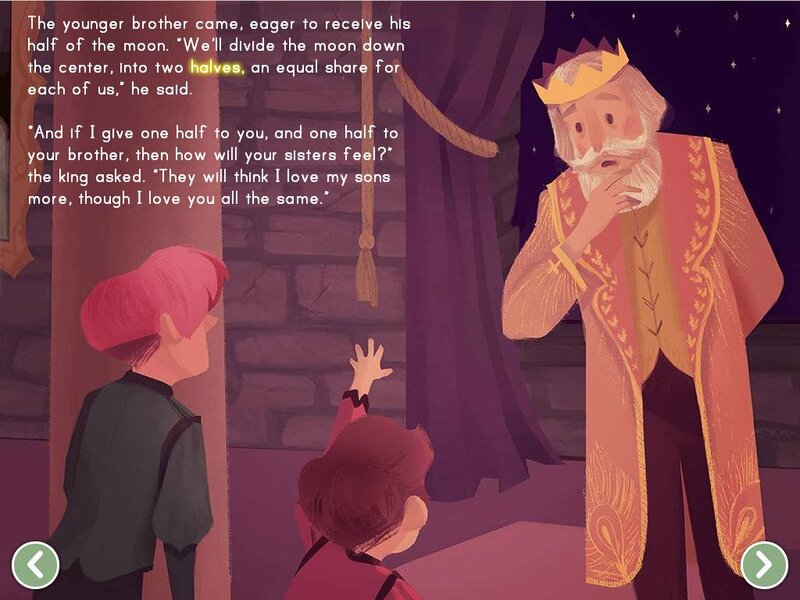 Also explain that a non-defining attribute is something that a shape might have and/or many shapes can share -- for example, a size or colour of a shape. Explain that today you are going to play a game called “Shape Quiz” with a partner to practise matching a shape to its defining attributes. Draw a square on the board and ask the class how they would describe its defining attributes. Answers should include: Four equal sides, four equal angles, polygon, and quadrilateral. Record the defining attributes on the whiteboard or chart paper for the class to read and see visually. Review the terms polygon and quadrilateral if needed. A PolygonIs a 2D shape with more than two sides and formed with straight lines. A QuadrilateralIs a 2D shape with four sides. Pass out the index cards with shapes to your students. Ask the students to look carefully at the shape on their card and think about its defining attributes. Say, “Hold your shape up if your shape is a polygon.” Check to ensure student understanding and review the term “polygon” if needed. Continue to ask questions about shapes for students to hold up. Possible questions could be, “Is your shape a quadrilateral? 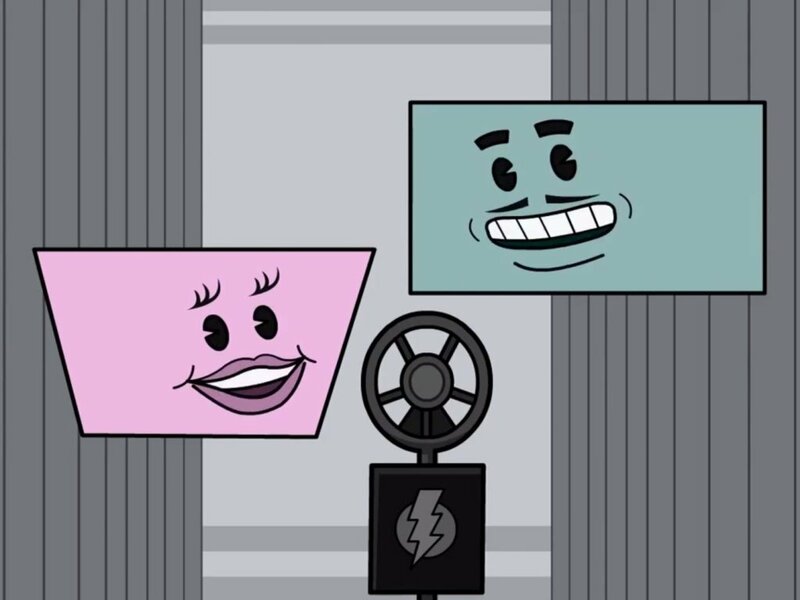 Does it have three equal sides? Does it have four equal sides? Are all points equal distance from its centre (circle)? Does it have two long and two short sides? Tell students that they will now get to play “Guess My Shape” with a partner. Explain the rules: One student will pick a card and read the defining attributes to their partner, and the partner will try to guess the shape. 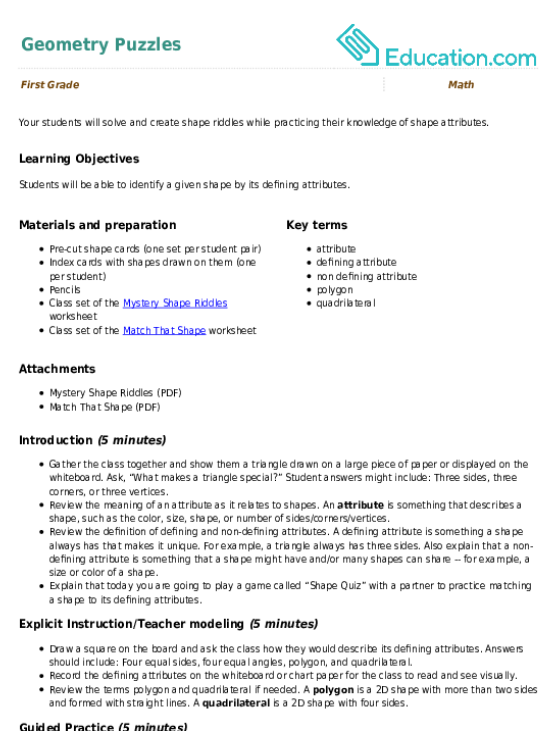 Display the Mystery Shape Riddles worksheet and explain that after playing a few rounds, students will get to create their own shape riddle and see if their partner can guess their shape. Pair students up and pass out a shape card set and worksheets to each pair. Circulate around the room as students play the game and provide support as needed. After 10 minutes, pause your students and encourage them to begin their own shape riddles if they haven’t already. For students who struggle to remember shape names and/or attributes, gather a small group together to guess a shape collaboratively. 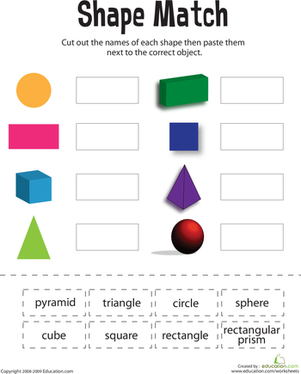 Provide students with the shape matching worksheet to practise identifying shapes with their names. 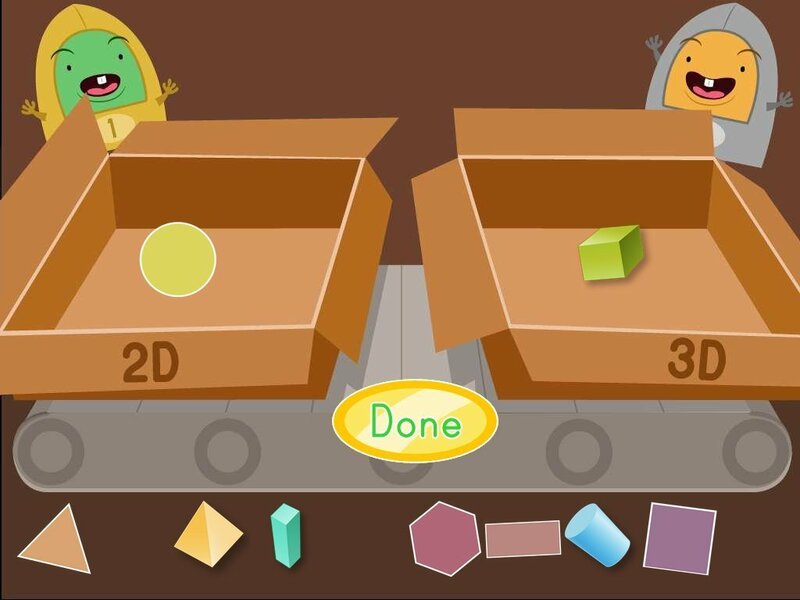 Encourage students to use 3D shapes in their shape riddles in addition to 2D shapes. Have student pairs identify the defining attributes of a shape when provided with the shape name. During the independent work time, check student understanding by tracking which students are able to guess the shape by its attributes. 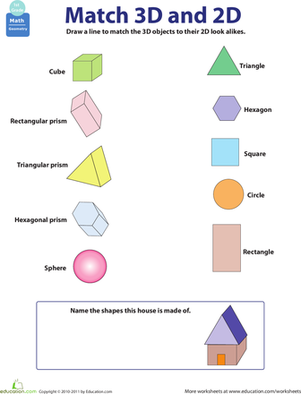 Collect student worksheets to determine if students were able to accurately depict a shape by its defining attributes. Invite a few students to share their shape riddles with the class. Ask the class to solve each riddle. Review any misconceptions you noticed during independent work time to the whole group. Boost geometry knowledge and enhance creativity with this fun maths worksheet. 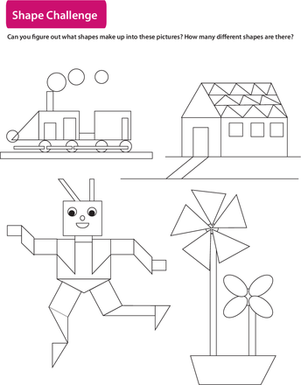 This shape challenge worksheet doubles as a coloring page, and builds early geometry skills. 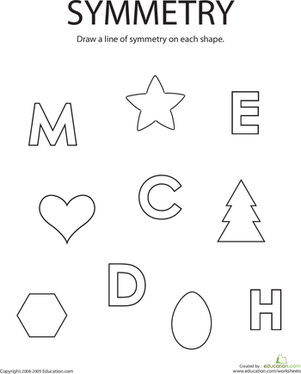 Help your child with his geometry skills with this printable worksheet, which is all about symmetry.